Aluminum channels also have high electrical conductivity and are good heat conductors and reflectors, making them ideal for heat transfer and heat shield applications. Industries that benefit from the utilization of aluminum channels include construction, industrial manufacturing, shipping, automotive, aerospace, medical and automotive. Aluminum channels are formed during the extrusion process, in which round aluminum stock called “billets” or “logs” are pressed by a ram through a die, which is a hollow profile that shapes the aluminum into a specific extruded shape as the billet is squeezed through. 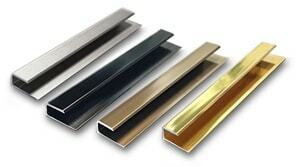 Aluminum channels can be made using two different types of extrusion process: indirect extrusion and direct extrusion. Direct extrusion holds the die stationary while the ram forces the aluminum alloy through the die opening, while indirect extrusion holds the die stationary as the hollow ram moves into the stationary billet from one end, forcing the metal to flow through the die. In addition, extrusion processes include hot extrusion, cold extrusion and warm extrusion. In cold extruding, aluminum billet is pressed through the die at room temperature or near room temperature. Warm extruding, or forging, is done on billets brought to temperature ranges between 800 and 1800 degrees F. Hot extrusions are performed on aluminum which has been fully plasticized by heat and is often performed in a vacuum to avoid oxidation. After an aluminum channel has been extruded, it is straightened by a stretcher. On an additional note, aluminum channels are an environmentally-friendly product because using aluminum channels in transportation often saves on carbon emissions, as aluminum is a far lighter metal than its alternatives, such as steel. Aluminum Channels One of many possible extruded aluminum shapes, aluminum channels are smooth, linear and fairly narrow. Extruded aluminum channels often provide a supportive frame for roll formed products and are ideal for engineering and structural applications such as light building frames, frame extensions, light poles, lighting fixtures, window frames, car bumpers, hardware joints and boat dock ladders.